every summer, pollens fly past Lake Van in Turkey. Pollens scattered in the air by various means get deposited on the lake's bed. Then a layer of mud covers it. This phenomenon repeats itself every year. An inch-thick layer of lime--calcium carbonate--also trickles down to find its final resting place at the bottom of the lake. The lime, along with the pollens, forms the 'summer sediment'--much sought after by palaentologists to track climate history. They are now trying to detect, right down to the specific year, what climatic conditions prevailed during the time of the Neanderthals. The archives, recently discovered by an international team of researchers headed by the University of Bonn, could be half a million years old. The problem with finding such specific results, is that preliminary investigations have shown that climate occasionally changed suddenly.In winters, too, the continual 'snowdrift' beneath the surface changes the colour of the deposit to dark brown, with clay as the main ingredient in the sediment. At a depth of 400 metres, no storm or waves disturbs it. The 'annual rings' in the sediment can be traced back to hundreds of thousands of years. "In some places, the layer of sediment is up to 400 metres thick," Bonn palaeontologist Thomas Litt, spokesperson of an international consortium of scientists working on the lake, says. "There are about 20,000 annual strata to every 10 metres. We presume that the bottom of Lake Van stores the climate history of the last 800,000 years--an incomparable treasure house of data which we want to tap for at least the last 500,000 years," he adds. Hopeful The sediment promises to deliver a host of exciting results. Vulcanologists can, for example, determine when volcanoes near the lake erupted. "It leads to a black layer of ash between the annual layers. With our test drill we counted 15 outbreaks in the past 20,000 years," says Litt. Pollen also permits precise information about temperature and average amount of precipitation for the period covered by the finds, as every species makes different demands on its environment. "If we find pollen in a specimen from different species, whose demands on its habitat are known, we can make a plausibility statement about the nature of the climate of the time," he adds. 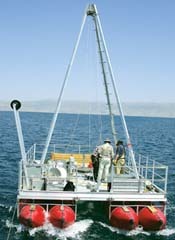 Lake Van promises to provide unique insights into the development of the climate in Eurasia and thus for assessing the current warm period.